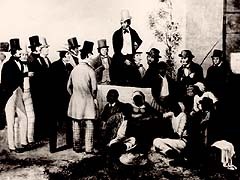 click image for close-up This 1852 oil painting depicting the scene of a slave market was created five years before the sale of 436 of Pierce Butler's slaves. One of the slave's greatest fears was to be sold off and separated from loved ones. According to Mortimer Thomson, a newspaper correspondent who covered the Butler sale, "The expression on the faces of all who stepped on the block was always the same, and told of more anguish than it is in the power of words to express."